The words beautiful and acne are words you don't often hear in the same breath. Whenever the topic of acne is brought to the table, the context of that conversation goes along the lines of "how to get rid of it? "/ "how to cover it?" or "All the thing that you're doing wrong when it comes to your skin!" but many of these conversations lack the idea that for some people it's not just the matter of changing the products you use or what concealer you use to cover it, but how it makes you feel. According to Statisticbrain.com, the acne treatment industry is a $3 billion a year industry, and there is around 60 million acne suffers in America alone. For me and many others alike, acne wasn't a small concern, but it seemingly has the power to control your social life. Acne can often make those who have it feel so out of control of their own faces. Marina McCarthy, who is no stranger to an occasional breakout, said “having a breakout can really affect your self-confidence.” At its worst acne can make you not want to be social or look people in the eye, and most importantly it can cause your confidence to drastically decline. 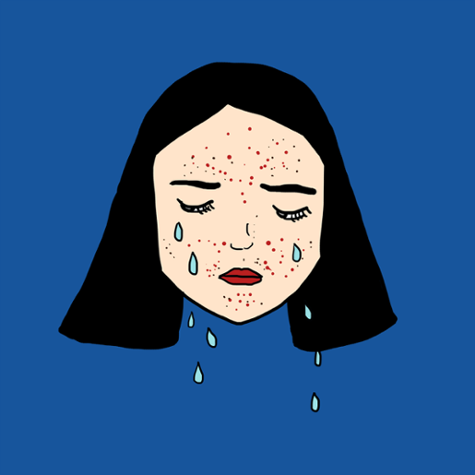 According to The Journal of Clinical and Aesthetic Dermatology, "Along with acne, having acne scars is a risk factor for suicide and may be linked to poor self-esteem, depression, anxiety, altered social interactions, body image alterations, embarrassment, anger, lowered academic performance, and unemployment." In the age of Photoshop, Facetune, and filters galore, how is one supposed to feel when are faces doesn't match with the perfect complexions we are surrounded by. When a breakout pops up on your face it’s so instinctual that we scramble to cover it as best we can, but we should remember that it is okay to have flaws. As expressed by Alice Newell-Hanson from i-D, "We are now living in a modern time that is becoming more accepting of body positivity and loving what you got, and the same should go for acne positivity". When I asked my friend Maeve Duke, who like many has dealt with acne about this issue she said, “It’s really refreshing to see someone embrace their imperfections and be real, especially on social media where people can often be quite judgmental.” Seeing people being honest about their blemishes can really make you feel like you're not the only one that is struggling, especially when it's someone that you may admire like a celebrity or public figure.